Regardless of how much money you make or the frequency of payday, you need to have a budget. But, when your income varies from paycheck to paycheck, it can be a struggle. How can you make a budget work when you have irregular income? If you are one of those people who have a paycheck that fluctuates, creating a budget may be very difficult. If you happen to have various hours or are even paid based on commissions, you know that your paycheck can swing from one extreme to the other week after week. What tends to happen is that people will overspend on the months when they have more money. It is just human nature. You’ll have to be willing to change your way of thinking. To ever make any change in your life, you have to commit to it (even if it is something challenging). No matter your income or payday schedule, you still must have a budget. There is no getting around that. Having an irregular income does add another layer of complexity, but it is not impossible to manage. I’m here to help you do just that. If you are just learning about budgeting, you will want to check out our page — How to Budget. Learn everything you want to know about budgets and budgeting. 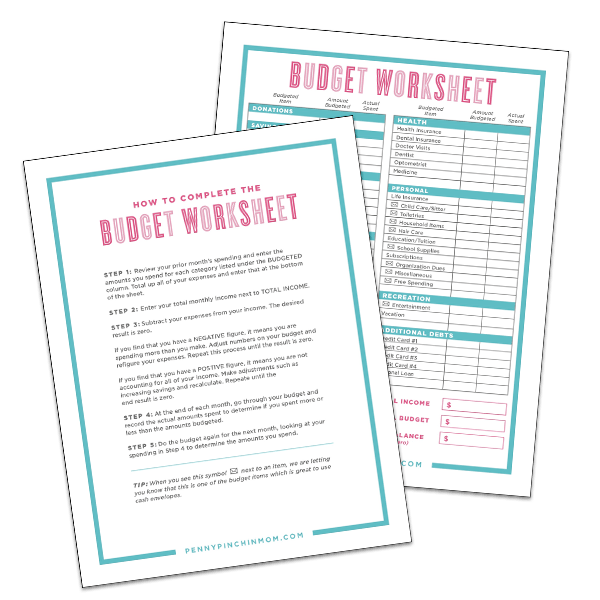 Before you can create a budget, you need to know how you spend your money from every paycheck. Doing so gives you a better picture of where your money goes. To learn your spending patterns, start by looking at where your money goes for every pay period over the past 2 – 3 months. Write down every purchase you make, right down the $5 coffee you buy each day. Doing so really helps you know how much you need to live on from each pay period and adjustments you need to make when creating your budget. You can get the details on How to Create a Spending Plan here. The next step is to calculate the income to use on your budget. Since it changes from paycheck to paycheck, you will determine an average amount to use on your budget. If you are paid a salary and also receive commissions, you will determine your income for your budget only on your salary. Commissions should not be included and will be deemed “bonus pay” that you will use to pay towards debt or increase your savings. If you are paid every two weeks, also called bi-weekly, you need to determine a monthly average. There are a couple of ways you can do this. The first way is to add two paychecks together to get a monthly amount. Doing so leaves you with two bonus checks each year. Apply these towards your debt or to increase your savings. The other option is to determine a monthly average. Look at the amount you made in total the prior year (or add up your last 12 month’s worth of income) and then divide that by 12. You will have an income amount to use on your budget. If your paycheck falls once a month or every other week, it is simple to determine a monthly income. Total your paychecks for the past year and divide by 12. Doing so provides you with an average income to use on your budget. If you are paid solely on commissions, it can be tough to know how much to use to make your budget. Total the amount earned over the past 12 months (or as long as you have been working there). Divide that total by the number of month’s income you just added to arrive at an average income amount. For example, if you have five months worth of income and the total was $20,000, your monthly average to include on your budget would be $4,000 (20/5). Being self-employed can be great, but it can also create financial stress. When determining the income to use on your budget, look back at the past 12 – 18 month’s of income to determine an average monthly amount. Do a simple calculation where you total 12 months of income and then divide that total by 12, which will provide you with an average amount to use to make your budget. Now that you know where you spend your money, you need to fill out a budget. You will use your average income calculated above for the income portion. Then, refer to your spending plan to fill out the rest of the sheet so you can track your other spending and saving. You can also check out budget apps and programs which might be a perfect fit for you. It is vital that, at the end of each month, you sit back down and look at your budget. You will update the income portion of the budget with the amount you made. You will update all budgeted amounts with the amount you actually spent. You can now see how your money flows through your household. If your budget results in negative income, it means you overspent, and you need to make adjustments in the future so that you do not end up making the same mistakes the following month. However, if you find that you have money left over, then you have to be wise with what you do with it. Don’t just blow it. Set it aside in savings to cover the lean months, when your income may drop below the amount needed to cover your expenses. Many times, there are bills, such as mortgage or rent, that can eat up most of your budget. Rather than struggle when these amounts are due, always set aside a bit from each check so you can pay the bill when it is due. This is called the half-payment method. For example, if your mortgage or rent is $800 a month, set back $400 from your paycheck in the middle of the month. Then, when you get paid at the end or first of the month, you only need to use $400 from that check to add with the saved $400 to pay your bill. It’s a simple way to ensure you never have a shortfall from every paycheck. Having irregular income is not an excuse to not create or maintain a budget. You merely have to look at it a little bit differently.